"ALS" redirects here. For other uses, see ALS (disambiguation). "Motor neurone disease" redirects here. For the broader group of diseases, see Motor neuron disease. Amyotrophic lateral sclerosis (ALS), also known as Lou Gehrig's disease and motor neurone disease (MND), is a specific disease that causes the death of neurons which control voluntary muscles. Some also use the term "motor neuron disease" for a group of conditions of which ALS is the most common. ALS is characterized by stiff muscles, muscle twitching, and gradually worsening weakness due to muscles decreasing in size. This results in difficulty in speaking, swallowing, and eventually breathing. The cause is not known in 90% to 95% of cases. About 5–10% of cases are inherited from a person's parents. About half of these genetic cases are due to one of two specific genes. The diagnosis is based on a person's signs and symptoms with testing done to rule out other potential causes. No cure for ALS is known. A medication called riluzole may extend life by about two to three months. Non-invasive ventilation may result in both improved quality and length of life. The disease usually starts around the age of 60 and in inherited cases around the age of 50. The average survival from onset to death is two to four years. About 10% survive longer than 10 years. Most die from respiratory failure. In much of the world, rates of ALS are unknown. In Europe and the United States the disease affects about two people per 100,000 per year. Descriptions of the disease date back to at least 1824 by Charles Bell. In 1869, the connection between the symptoms and the underlying neurological problems was first described by Jean-Martin Charcot, who in 1874 began using the term amyotrophic lateral sclerosis. It became well known in the United States in the 20th century when in 1939 it affected the baseball player Lou Gehrig and later worldwide when physicist Stephen Hawking, diagnosed in 1963 and expected to die within two years, became famous. In 2014 videos of the ice bucket challenge went viral on the internet and increased public awareness of the condition. ALS is a motor neuron disease, also spelled "motor neurone disease" which is a group of neurological disorders that selectively affect motor neurons, the cells that control voluntary muscles of the body, including amyotrophic lateral sclerosis (ALS), primary lateral sclerosis, progressive muscular atrophy, progressive bulbar palsy, pseudobulbar palsy, and spinal muscular atrophy. ALS itself can be classified a few different ways - by how fast the disease progresses (slow vs fast progressors), by whether it is inherited or sporadic, and by where it starts. Most commonly (~70% of the time) the limbs are affected first - in this case neurons in the brain (upper motor neurons) and in the spinal cord (lower motor neurons) are dying and this form is called "limb onset". In about 25% of cases, muscles in the face, mouth, and throat are affected first because motor neurons in the part of the brain stem called the Medulla oblongata (formerly called the "bulb") start to die first along with lower motor neurons - this form is called "bulbar onset". In about 5% of cases muscles in the trunk of the body are affected first. In all cases the disease spreads and affects other regions. The disorder causes muscle weakness and atrophy throughout the body due to the degeneration of the upper and lower motor neurons. Individuals affected by the disorder may ultimately lose the ability to initiate and control all voluntary movement, although bladder and bowel function and the muscles responsible for eye movement are usually spared until the final stages of the disorder. Cognitive and/or behavioural dysfunction is present in up to half of individuals with ALS. Around half of people with ALS will experience mild changes in cognition and behaviour, and 10 - 15% will show signs of frontotemporal dementia. Repeating phrases or gestures, apathy, and loss of inhibition are frequently reported behavioural features of ALS. Language dysfunction, executive dysfunction, and troubles with social cognition and verbal memory are the most commonly reported cognitive symptoms in ALS; a meta-analysis found no relationship between dysfunction and disease severity. However, cognitive and behavioral dysfunctions have been found to correlate with reduced survival in people with ALS and increased caregiver burden; this may be due in part to deficits in social cognition. About half the people who have ALS experience emotional lability, in which they cry or laugh for no reason. Sensory nerves and the autonomic nervous system are generally unaffected, meaning the majority of people with ALS maintain hearing, sight, touch, smell, and taste. The start of ALS may be so subtle that the symptoms are overlooked. The earliest symptoms of ALS are muscle weakness and/or muscle atrophy. Other presenting symptoms include trouble swallowing or breathing, cramping, or stiffness of affected muscles; muscle weakness affecting an arm or a leg; and/or slurred and nasal speech. The parts of the body affected by early symptoms of ALS depend on which motor neurons in the body are damaged first. In limb onset ALS people first experience awkwardness when walking or running or even tripping over or stumbling may be experienced and often this is marked by walking with a "dropped foot" which drags gently on the ground. Or if arm-onset, difficulty with tasks requiring manual dexterity such as buttoning a shirt, writing, or turning a key in a lock may be experienced. In bulbar-onset ALS, initial symptoms will mainly be of difficulty speaking clearly or swallowing. Speech may become slurred, nasal in character, or quieter. There may be difficulty in swallowing and loss of tongue mobility. A smaller proportion of people experience "respiratory-onset" ALS, where the intercostal muscles that support breathing are affected first. Over time, people experience increasing difficulty moving, swallowing (dysphagia), and speaking or forming words (dysarthria). Symptoms of upper motor neuron involvement include tight and stiff muscles (spasticity) and exaggerated reflexes (hyperreflexia) including an overactive gag reflex. An abnormal reflex commonly called Babinski's sign also indicates upper motor neuron damage. Symptoms of lower motor neuron degeneration include muscle weakness and atrophy, muscle cramps, and fleeting twitches of muscles that can be seen under the skin (fasciculations) although twitching is not a diagnostic symptom and more of a side effect so twitching would either occur after or accompany weakness and atrophy. Although the order and rate of symptoms varies from person to person, the disease eventually spreads to unaffected regions and the affected regions become more affected. Most people eventually are not able to walk or use their hands and arms, lose the ability to speak and swallow food and their own saliva, and begin to lose the ability to cough and to breathe on their own. The rate of progression can be measured using an outcome measure called the "ALS Functional Rating Scale Revised (ALSFRS-R)", a 12-item instrument administered as a clinical interview or self-reported questionnaire that produces a score between 48 (normal function) and 0 (severe disability); it is the most commonly used outcome measure in clinical trials and is used by doctors to track disease progression. Though the degree of variability is high and a small percentage of people have a much slower disorder, on average, people with ALS lose about 0.9 FRS points per month. A survey-based study amongst clinicians showed that they rated a 20% change in the slope of the ALSFRS-R as being clinically meaningful. Disorder progression tends to be slower in people who are younger than 40 at onset, are mildly obese, have disorder restricted primarily to one limb, and those with primarily upper motor neuron symptoms. Conversely, progression is faster and prognosis poorer in people with bulbar-onset disorder, respiratory-onset disorder, and frontotemporal dementia. The CX3CR1 allelic variants have also been shown to have an effect on the disorder's progression and life expectancy. Difficulty in chewing and swallowing makes eating very difficult and increases the risk of choking or of aspirating food into the lungs. In later stages of the disorder, aspiration pneumonia can develop, and maintaining a healthy weight can become a significant problem that may require the insertion of a feeding tube. As the diaphragm and intercostal muscles of the rib cage that support breathing weaken, measures of lung function such as vital capacity and inspiratory pressure diminish. In respiratory-onset ALS, this may occur before significant limb weakness is apparent. Most people with ALS die of respiratory failure or pneumonia. Although respiratory support can ease problems with breathing and prolong survival, it does not affect the progression of ALS. Most people with ALS die between 2 and four years after the diagnosis. Around half of people with ALS die within 30 months of their symptoms beginning, and about 20% of people with ALS live between 5 years and 10 years after symptoms begin. Guitarist Jason Becker has lived since 1989 with the disorder, while physicist Stephen Hawking has survived for more than 50 years, but they are considered unusual cases. Most people with ALS die in their own home, with their breath failing while they sleep; people rarely choke to death. About 5–10% of cases are directly inherited from a person's parents. Overall, first-degree relatives of an individual with ALS have a 1% risk of developing ALS. A defect on chromosome 21, which codes for superoxide dismutase, is associated with about 20% of familial cases of ALS, or about 2% of ALS cases overall. This mutation is believed to be transmitted in an autosomal dominant manner, and has over a hundred different forms of mutation. The most common ALS-causing mutation is a mutant SOD1 gene, seen in North America; this is characterized by an exceptionally rapid progression from onset to death. The most common mutation found in Scandinavian countries, D90A-SOD1, is more slowly progressive than typical ALS, and people with this form of the disorder survive for an average of 11 years. In 2011, a genetic abnormality known as a hexanucleotide repeat was found in a region called C9orf72, which is associated with ALS combined with frontotemporal dementia ALS-FTD, and accounts for some 6% of cases of ALS among white Europeans. The UBQLN2 gene encodes production of the protein ubiquilin 2 in the cell, which is a member of the ubiquilin family and controls the degradation of ubiquitinated proteins. Mutations in UBQLN2 interfere with protein degradation, leading to neurodegeneration and causing dominantly inherited, chromosome X-linked ALS and ALS/dementia. ALS22 616208 TUBA4A 2q35 autosomal dominant (?) "Amyotrophic lateral sclerosis 22 with or without frontotemporal dementia"
FTDALS2 615911 CHCHD10 22q11.23 autosomal dominant (?) "Frontotemporal dementia and/or amyotrophic lateral sclerosis type 2"
FTDALS3 616437 SQSTM1 5q35.3 autosomal dominant (?) "Frontotemporal dementia and/or amyotrophic lateral sclerosis type 3"
FTDALS4 616439 TBK1 12q14.2 autosomal dominant (?) "Frontotemporal dementia and/or amyotrophic lateral sclerosis type 4"
In 1993, scientists discovered that mutations in the gene (SOD1) that produces the Cu-Zn superoxide dismutase (SOD1) enzyme were associated with around 20% of familial ALS. This enzyme is a powerful antioxidant that protects the body from damage caused by superoxide, a toxic free radical generated in the mitochondria. Free radicals are highly reactive molecules produced by cells during normal metabolism. Free radicals can accumulate and cause damage to DNA and proteins within cells. To date, over 110 different mutations in SOD1 have been linked with the disorder, some of which (such as H46R) have a very long clinical course, while others, such as A4V, are exceptionally aggressive. When the defenses against oxidative stress fail, programmed cell death (apoptosis) is upregulated. A defect in SOD1 could be a loss or gain of function. A loss of SOD1 function could lead to an accumulation of free radicals. A gain of SOD1 function could be toxic in other ways. Aggregate accumulation of mutant SOD1 is suspected to play a role in disrupting cellular functions by damaging mitochondria, proteasomes, protein folding chaperones, or other proteins. Any such disruption, if proven, would lend significant credibility to the theory that aggregates are involved in mutant SOD1 toxicity. Critics have noted that in humans, SOD1 mutations cause only 2% or so of overall cases and the etiological mechanisms may be distinct from those responsible for the sporadic form of the disease. To date, the ALS-SOD1 mice remain the best model of the disease for preclinical studies, but it is hoped that more useful models will be developed. While moderate to severe traumatic brain injury is a risk for ALS, it is unclear if mild traumatic brain injury increases rates. In 1994 the National Institute for Occupational Safety and Health (NIOSH) reported a nonsignificant increase in nervous system disorders due to four cases of ALS among NFL football players. It was unclear if this was due to chance or not. Another study from 2012 also found a possible increase in ALS in NFL football players. An older study did not find an increased risk among high school football players. A 2007 review found an increased risk among soccer players. ALS may also occur more often among the US military veterans however the reason is unknown. This may be due to head injury. After the 2012 report was released, some NFL players involved in the legal settlement with the NFL complained that the NFL, which initially agreed to pay $765 million, was not doing enough to help players. The judge in the case concurred, and the NFL then agreed to pay an unlimited amount of damages for players found to have ALS, Parkinson’s disease, Alzheimer’s disease and dementia. Where no family history of the disease is present – i.e., in around 90% of cases – no cause is known for ALS. Possible associations for which evidence is inconclusive include military service, frequent drug use, and participation in contact sports. Studies also have focused on the role of glutamate in motor neuron degeneration. Glutamate is one of the neurotransmitters in the brain. Scientists have found, compared with healthy people, people with ALS have higher levels of glutamate in their serum and spinal fluid. Riluzole, which targets glutamate transporters, is currently the only FDA-approved drug for ALS. It has only a modest effect on survival, however, suggesting that excess glutamate is not the sole cause of the disease. Certain studies suggested a link between sporadic ALS, specifically in athletes, and a diet enriched with branched-chain amino acids, a common dietary supplement among athletes, which cause cell hyperexcitability resembling that usually observed in people with ALS. The proposed underlying mechanism is that cell hyperexcitability results in increased calcium absorption by the cell, and thus brings about cell death of neuronal cells, which have particularly low calcium buffering capabilities. Some evidence supports the hypothesis that superoxide dismutase 1 (SOD1) protein misfolding propagates between molecules in a similar fashion to prions. Similarly, it has been proposed that incorporation of the cyanobacterial toxin β-methylamino-l-alanine (BMAA) leads to another prion-like protein misfolding propagation. Another very common factor associated with ALS is a lesion to the motor system in areas such as the frontotemporal lobes. Lesions in these areas often show signs of early deficit, which can be used to predict the loss of motor function, and result in the spread of ALS. The mechanisms of ALS are present long before any signs or symptoms become apparent. Before any muscular atrophy becomes apparent during ALS, roughly one-third of the motor neurons must be destroyed. Other potential risk factors including chemical exposure, electromagnetic field exposure, occupation, physical trauma, and electric shock, have been investigated, but are without consistent findings. There is a tentative association with exposure to a number of pesticides including the organochlorine insecticides aldrin, dieldrin, DDT, and toxaphene. The defining feature of ALS is the death of both upper and lower motor neurons in the motor cortex of the brain, the brain stem, and the spinal cord. Prior to their destruction, motor neurons develop protein-rich inclusions in their cell bodies and axons. This may be partly due to defects in protein degradation. These inclusions often contain ubiquitin, and generally incorporate one of the ALS-associated proteins: SOD1, TAR DNA binding protein (TDP-43, or TARDBP), and/or FUS. 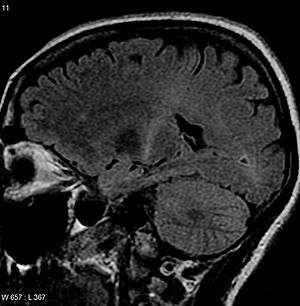 MRI (axial FLAIR) demonstrates increased T2 signal within the posterior part of the internal capsule, consistent with the diagnosis of ALS. No test can provide a definite diagnosis of ALS, although the presence of upper and lower motor neuron signs in a single limb is strongly suggestive. Instead, the diagnosis of ALS is primarily based on the symptoms and signs the physician observes in the person and a series of tests to rule out other diseases. Physicians obtain the person's full medical history and usually conduct a neurologic examination at regular intervals to assess whether symptoms such as muscle weakness, atrophy of muscles, hyperreflexia, and spasticity are worsening. Because symptoms of ALS can be similar to those of a wide variety of other, more treatable diseases or disorders, appropriate tests must be conducted to exclude the possibility of other conditions. One of these tests is electromyography (EMG), a special recording technique that detects electrical activity in muscles. Certain EMG findings can support the diagnosis of ALS. Another common test measures nerve conduction velocity (NCV). Specific abnormalities in the NCV results may suggest, for example, that the person has a form of peripheral neuropathy (damage to peripheral nerves) or myopathy (muscle disease) rather than ALS. While a magnetic resonance imaging (MRI) is often normal in people with early stage ALS, they can reveal evidence of other problems that may be causing the symptoms, such as a spinal cord tumor, multiple sclerosis, a herniated disk in the neck, syringomyelia, or cervical spondylosis. Based on the person's symptoms and findings from the examination and from these tests, the physician may order tests on blood and urine samples to eliminate the possibility of other diseases, as well as routine laboratory tests. In some cases, for example, if a physician suspects the person may have a myopathy rather than ALS, a muscle biopsy may be performed. Viral infectious diseases such as human immunodeficiency virus (HIV), human T-cell leukaemia virus (HTLV), Lyme disease, syphilis and tick-borne encephalitis can in some cases cause ALS-like symptoms. Neurological disorders such as multiple sclerosis, post-polio syndrome, multifocal motor neuropathy, CIDP, spinal muscular atrophy, and spinal and bulbar muscular atrophy can also mimic certain aspects of the disease and should be considered. ALS must be differentiated from the "ALS mimic syndromes" which are unrelated disorders that may have a similar presentation and clinical features to ALS or its variants. Because of the prognosis carried by this diagnosis and the variety of diseases or disorders that can resemble ALS in the early stages of the disease, people should always obtain a specialist neurological opinion, so alternative diagnoses are clinically ruled out. Benign fasciculation syndrome is another condition that mimics many of the symptoms of ALS, but is accompanied by normal EMG readings and no major disablement. However, most cases of ALS are readily diagnosed and the error rate of diagnosis in large ALS clinics is less than 10%. In one study, 190 people who met the MND/ALS diagnostic criteria, complemented with laboratory research in compliance with both research protocols and regular monitoring. Thirty of these people (16%) had their diagnosis completely changed during the clinical observation development period. In the same study, three people had a false negative diagnosis, myasthenia gravis (MG), an autoimmune disease. MG can mimic ALS and other neurological disorders leading to a delay in diagnosis and treatment. MG is eminently treatable; ALS is not. Myasthenic syndrome, also known as Lambert–Eaton syndrome, can mimic ALS and its initial presentation can be similar to that of MG.
Management of ALS attempts to relieve symptoms and extend life expectancy. This supportive care is best provided by multidisciplinary teams of health care professionals working with the person and their caregivers to keep them as mobile and comfortable as possible. Riluzole has been found to modestly improve survival by approximately two to three months. It may have a greater survival benefit for those with a bulbar onset. It also extends the time before a person needs ventilation support. People taking it must be monitored for liver damage (occurring in about 10% of people taking the drug). It is approved by Food and Drug Administration (US) and recommended by the National Institute for Clinical Excellence (UK). Riluzole does not reverse damage already done to motor neurons. In 2015 edaravone was approved for treatment ALS in Japan and drug obtained Orphan Drug Designation in the EU and USA. Other medications may be used to help reduce fatigue, ease muscle cramps, control spasticity, and reduce excess saliva and phlegm. Drugs also are available to help people with pain, depression, sleep disturbances, dysphagia, and constipation. Baclofen and diazepam are often prescribed to control the spasticity caused by ALS, and trihexyphenidyl or amitriptyline may be prescribed when people with ALS begin having trouble swallowing their saliva. When the muscles that assist in breathing weaken, use of ventilatory assistance (intermittent positive pressure ventilation, bilevel positive airway pressure (BiPAP), or biphasic cuirass ventilation (BCV) may be used to aid breathing. Such devices artificially inflate the person's lungs from various external sources that are applied directly to the face or body. When muscles are no longer able to maintain oxygen and carbon dioxide levels, these devices may be used full-time. BCV has the added advantage of being able to assist in clearing secretions by using high-frequency oscillations followed by several positive expiratory breaths. People may eventually consider forms of mechanical ventilation (respirators) in which a machine inflates and deflates the lungs. To be effective, this may require a tube that passes from the nose or mouth to the windpipe (trachea) and for long-term use, an operation such as a tracheotomy, in which a plastic breathing tube is inserted directly in the person's windpipe through an opening in the neck. Persons and their families should consider several factors when deciding whether and when to use one of these options. Ventilation devices differ in their effect on the person's quality of life and in cost. Although ventilation support can ease problems with breathing and prolong survival, it does not affect the progression of ALS. People need to be fully informed about these considerations and the long-term effects of life without movement before they make decisions about ventilation support and have deep discussions on quality of life. Some persons under long-term tracheotomy intermittent positive pressure ventilation with deflated cuffs or cuffless tracheotomy tubes (leak ventilation) are able to speak, provided their bulbar muscles are strong enough, though in all cases speech will be lost as the disease progresses. This technique preserves speech in some persons with long-term mechanical ventilation. Other persons may be able to use a speaking valve such as a Passey-Muir speaking valve with the assistance and guidance of a speech-language pathologist. External ventilation machines that use the ventilation mode of BiPAP are frequently used to support breathing, initially at night, and later during the daytime, as well. The use of BPAP (more often referred to as noninvasive ventilation, NIV) is only a temporary remedy, however, and long before BPAP stops being effective, persons should decide whether to have a tracheotomy and long-term mechanical ventilation. At this point, some persons choose palliative hospice care. Using low tech to communicate. A man with ALS communicates by pointing to letters and words using a head mounted laser pointer. Physical therapy plays a large role in rehabilitation for individuals with ALS. Specifically, physical and occupational therapists can set goals and promote benefits for individuals with ALS by delaying loss of strength, maintaining endurance, limiting pain, preventing complications, and promoting functional independence. Occupational therapy and special equipment such as assistive technology can also enhance people's independence and safety throughout the course of ALS. Gentle, low-impact aerobic exercise such as performing activities of daily living, walking, swimming, and stationary bicycling can strengthen unaffected muscles, improve cardiovascular health, and help people fight fatigue and depression. Range of motion and stretching exercises can help prevent painful spasticity and shortening (contracture) of muscles. Physical and occupational therapists can recommend exercises that provide these benefits without overworking muscles. They can suggest devices such as ramps, braces, walkers, bathroom equipment (shower chairs, toilet risers, etc. ), and wheelchairs that help people remain mobile. Occupational therapists can provide or recommend equipment and adaptations to enable people to retain as much safety and independence in activities of daily living as possible. People with ALS who have difficulty speaking may benefit from working with a speech-language pathologist. These health professionals can teach people adaptive strategies such as techniques to help them speak louder and more clearly. As ALS progresses, speech-language pathologists can recommend the use of augmentative and alternative communication such as voice amplifiers, speech-generating devices (or voice output communication devices) and/or low tech communication techniques such as head mounted laser pointers, alphabet boards or yes/no signals. People with ALS and caregivers can learn from dieticians how to plan and prepare numerous small meals throughout the day that provide enough calories, fiber and fluid, and how to avoid foods that are difficult to swallow. People may begin using suction devices to remove excess fluids or saliva and prevent choking. Occupational therapists can assist with recommendations for adaptive equipment to ease the physical task of self-feeding. Speech-language pathologists make food choice recommendations that are more conducive to their unique deficits and abilities. When people with ALS can no longer get enough nourishment from eating, doctors may advise inserting a feeding tube into the stomach. The use of a feeding tube also reduces the risk of choking and pneumonia that can result from inhaling liquids into the lungs. The tube is not painful and does not prevent people from eating food orally if they wish. Researchers have stated, "ALS patients have a chronically deficient intake of energy and recommended augmentation of energy intake" and have a severe loss of appetite. Both animal and human research  suggest that ALS patients should be encouraged to consume as many calories as possible and not to restrict their caloric intake. As of 2012, "a lack of robust evidence for interventions" remained for the management of weight loss. Social workers and home care and hospice nurses help people with ALS, their families, and caregivers with the medical, emotional, and financial challenges of coping, particularly during the final stages of the disease. Social workers provide support such as assistance in obtaining financial aid, arranging durable power of attorney, preparing a living will, and finding support groups for patients and caregivers. Home nurses are available not only to provide medical care, but also to teach caregivers about tasks such as maintaining respirators, giving feedings, and moving people to avoid painful skin problems and contractures. 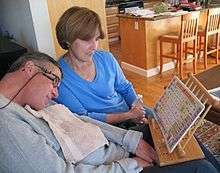 Home hospice nurses work in consultation with physicians to ensure proper medication, pain control, and other care affecting the quality of life of people with ALS who wish to remain at home. The home hospice team can also counsel people with ALS and caregivers about end-of-life issues. In much of the world, rates of ALS are unknown. In Europe, the disease affects about 2.2 people per 100,000 per year. In the United States, more than 5,600 are diagnosed every year (over 1.87 per 100,000 per year), and up to 30,000 Americans are currently affected. ALS is responsible for two deaths per 100,000 people per year. ALS is classified as a rare disease, designated by the FDA as an “orphan” disease (affecting fewer than 200,000 people in the United States), but is the most common motor neuron disease. People of all races and ethnic backgrounds are affected. One or two of 100,000 people develop ALS each year. Amyotrophic lateral sclerosis affects around 30,000 Americans. ALS cases are estimated at 1.2–4.0 per 100,000 individuals in Caucasian populations with a lower rate in other ethnic populations. Filipinos are second to Caucasians in terms of ALS prevalence with 1.1-2.8 per 100,000 individuals. Reports have been made of several "clusters" including three American football players from the San Francisco 49ers, more than 50 association football players in Italy, three association football-playing friends in the south of England, and conjugal (husband and wife) cases in the south of France. Although many authors consider ALS to be caused by a combination of genetic and environmental risk factors, so far the latter have not been firmly identified, other than a higher risk with increasing age. Descriptions of the disease date back to at least 1824 by Charles Bell. English scientist Augustus Waller described the appearance of shriveled nerve fibers in 1850. In 1869, the connection between the symptoms and the underlying neurological problems were first described by Jean-Martin Charcot, who initially introduced the term amyotrophic lateral sclerosis in his 1874 paper. In 1881, the article was translated into English and published in a three-volume edition of Lectures on the Diseases of the Nervous System. ALS became a cause célèbre in the United States in 1939 when baseball legend Lou Gehrig's career, and two years later, his life, were ended by the disease. In the 1950s, an epidemic occurred among the Chamorro people on Guam which bore similarities to many conditions, including ALS. By 1991, researchers had linked chromosome 21 to familial ALS (FALS). In 1993, the SOD1 gene on chromosome 21 was found to play a role in some cases of FALS. In 1996, riluzole became the first FDA-approved drug for ALS. In 1998, the El Escorial criteria were developed as the standard for classifying people with ALS in clinical research. The next year, the revised ALS Functional Rating Scale was published and soon becomes a gold standard for clinical research. Noncoding repeat expansions in C9ORF72 were found to be a major cause of ALS and frontotemporal dementia in 2011. Amyotrophic comes from the Greek word amyotrophia: a- means "no", myo refers to "muscle", and trophia means "nourishment"; amyotrophia therefore means "no muscle nourishment," which describes the characteristic atrophy of the sufferer's disused muscle tissue. Lateral identifies the areas in a person's spinal cord where affected portions of the nerve cells are located. Degeneration in this area leads to scarring or hardening ("sclerosis"). In Commonwealth countries the term motor neurone disease (MND) is commonly used. In August 2014, a challenge went viral online which was commonly known as the "ALS Ice Bucket Challenge". Contestants fill a bucket full of ice and water, then state who nominated them to do the challenge, and nominate three other individuals of their choice to take part in it. The contestants then dump the buckets of ice and water onto themselves. However, it can be done in a different order. The contestants then donate at least US $10 (or a similar amount in their local currency) to ALS research at the ALS Association, or Motor Neurone Disease Association in the UK. Any contestants who refuse to have the ice and water dumped on them are expected to donate at least US$100 to ALS research. As of July 2015, the Ice Bucket Challenge had raised $115 million for the ALS Association. Many celebrities have taken part in the challenge. The Ice Bucket Challenge was credited with helping to raise funds that contributed to the discovery that the gene NEK1 may potentially contribute to the development for ALS. ALS is the central topic of the 2014 movie You're Not You, directed by George C. Wolfe, with Hilary Swank, Emmy Rossum and Josh Duhamel playing the main characters. A number of clinical trials are underway globally for ALS; a comprehensive listing of trials in the US can be found at ClinicalTrials.gov. A large genetic study, called project MinE, initiated by two people with ALS is going on currently. It is a crowdfunded research project with many countries involved to discover more genes. A division of the US Centers for Disease Control and Prevention maintains a registry of Americans with ALS. In 2009 researchers in the North American ALS Research Group started reviewing alternative and off-label ALS treatments that circulated on the internet and began publishing them under the rubric "ALS Untangled". As of 2014 the group of scientists and clinicians reviewing such treatments and publishing the results had expanded to 95 people in 10 different countries. Creatine has been well studied as a treatment for ALS; it has no effect. As of 2013 repetitive transcranial magnetic stimulation had been studied in ALS in small and poorly designed clinical trials; as of 2013 there was insufficient evidence to know if rTMS is safe or effective for ALS. In 2016 the ALS patient group PatientsLikeMe worked with investigators at Duke University to organize a clinical trial of the dietary supplement lunasin, which had been the subject of internet discussions among patients. Masitinib has been approved as an orphan medication in Europe and the United States with studies ongoing as of 2016. 1 2 3 4 5 6 7 8 9 10 11 12 13 14 15 16 17 18 19 20 21 "Amyotrophic Lateral Sclerosis (ALS) Fact Sheet". National Institute of Neurological Disorders and Stroke. 19 September 2014. Retrieved 2 January 2015. 1 2 Zarei, Sara; Carr, Karen; Reiley, Luz; Diaz, Kelvin; Guerra, Orleiquis; Altamirano, Pablo Fernandez; Pagani, Wilfredo; Lodin, Daud; Orozco, Gloria (2015-11-16). "A comprehensive review of amyotrophic lateral sclerosis". Surgical Neurology International. 6: 171. doi:10.4103/2152-7806.169561. ISSN 2229-5097. PMC 4653353 . PMID 26629397. 1 2 3 "Motor neurone disease". NHS Choices. Retrieved 2 January 2015. 1 2 3 4 "Motor Neuron Diseases Fact Sheet". National Institute of Neurological Disorders and Stroke. Retrieved 7 November 2010. 1 2 3 4 5 6 7 8 9 10 11 Kiernan, MC; Vucic, S; Cheah, BC; Turner, MR; Eisen, A; Hardiman, O; Burrell, JR; Zoing, MC (12 March 2011). "Amyotrophic lateral sclerosis.". Lancet. 377 (9769): 942–55. doi:10.1016/s0140-6736(10)61156-7. PMID 21296405. ↑ Miller, RG; Mitchell, JD; Moore, DH (14 March 2012). "Riluzole for amyotrophic lateral sclerosis (ALS)/motor neuron disease (MND).". The Cochrane database of systematic reviews. 3: CD001447. doi:10.1002/14651858.CD001447.pub3. PMID 22419278. ↑ McDermott, CJ; Shaw, PJ (22 March 2008). "Diagnosis and management of motor neurone disease.". BMJ (Clinical research ed.). 336 (7645): 658–62. doi:10.1136/bmj.39493.511759.be. PMC 2270983 . PMID 18356234. 1 2 3 4 5 6 7 Hobson, EV; McDermott, CJ (September 2016). "Supportive and symptomatic management of amyotrophic lateral sclerosis.". Nature reviews. Neurology. 12 (9): 526–38. PMID 27514291. ↑ "Epidemiology of Sporadic ALS". Retrieved 2 January 2015. 1 2 3 4 Rowland LP (March 2001). "How amyotrophic lateral sclerosis got its name: the clinical-pathologic genius of Jean-Martin Charcot". Arch. Neurol. 58 (3): 512–5. doi:10.1001/archneur.58.3.512. PMID 11255459. ↑ Kelly, Evelyn B. (2013). Encyclopedia of human genetics and disease. Santa Barbara, Calif.: Greenwood. pp. 79–80. ISBN 978-0-313-38713-5. ↑ Youngson, David B. Jacoby, Robert M. (2004). Encyclopedia of family health (3rd ed.). Tarrytown, NY: Marshall Cavendish. p. 1256. ISBN 978-0-7614-7486-9. ↑ Song, P (August 2014). "The Ice Bucket Challenge: The public sector should get ready to promptly promote the sustained development of a system of medical care for and research into rare diseases.". Intractable & rare diseases research. 3 (3): 94–6. doi:10.5582/irdr.2014.01015. PMID 25364651. ↑ Raaphorst, Joost; Beeldman, Emma; De Visser, Marianne; De Haan, Rob J.; Schmand, Ben (2012-10-01). "A systematic review of behavioural changes in motor neuron disease". Amyotrophic Lateral Sclerosis: Official Publication of the World Federation of Neurology Research Group on Motor Neuron Diseases. 13 (6): 493–501. doi:10.3109/17482968.2012.656652. ISSN 1471-180X. PMID 22424127. 1 2 Beeldman, Emma; Raaphorst, Joost; Twennaar, Michelle Klein; Visser, Marianne de; Schmand, Ben A.; Haan, Rob J. de (2015-08-17). "The cognitive profile of ALS: a systematic review and meta-analysis update". Journal of Neurology, Neurosurgery & Psychiatry: 611–9. doi:10.1136/jnnp-2015-310734. PMID 26283685. 1 2 "Motor neurone disease - Symptoms" (Page last reviewed: Jan 15, 2015). NHS Choices. Retrieved 18 September 2016. ↑ Gordon, PH; Miller, RG; Moore, DH (September 2004). "ALSFRS-R.". Amyotrophic lateral sclerosis and other motor neuron disorders : official publication of the World Federation of Neurology, Research Group on Motor Neuron Diseases. 5 Suppl 1: 90–3. PMID 15512883. ↑ Castrillo-Viguera C, Grasso DL, Simpson E, Shefner J, Cudkowicz ME (2010). "Clinical significance in the change of decline in ALSFRS-R". Amyotroph Lateral Scler (Journal Article). 11 (1–2): 178–80. doi:10.3109/17482960903093710. PMID 19634063. ↑ Sabatelli M, Madia F, Conte A, Luigetti M, Zollino M, Mancuso I, Lo Monaco M, Lippi G, Tonali P (16 September 2008). "Natural history of young-adult amyotrophic lateral sclerosis". Neurology. 71 (12): 876–81. doi:10.1212/01.wnl.0000312378.94737.45. PMID 18596241. ↑ Paganoni, Sabrina; Deng, Jing; Jaffa, Matthew; Cudkowicz, Merit E.; Wills, Anne-Marie (2011). "Body mass index, not dyslipidemia, is an independent predictor of survival in amyotrophic lateral sclerosis". Muscle & Nerve. 44 (1): 20–4. doi:10.1002/mus.22114. PMC 4441750 . PMID 21607987. Lay summary – Massachusetts General Hospital (May 11, 2011). 1 2 Chiò A, Calvo A, Moglia C, Mazzini L, Mora G (2011). "Phenotypic heterogeneity of amyotrophic lateral sclerosis: A population based study". Journal of Neurology, Neurosurgery & Psychiatry. 82 (7): 740–746. doi:10.1136/jnnp.2010.235952. PMID 21402743. ↑ Lopez-Lopez A, Gamez J, Syriani E, Morales M, Salvado M, Rodríguez MJ, Mahy N, Vidal-Taboada JM (2014). "CX3CR1 Is a Modifying Gene of Survival and Progression in Amyotrophic Lateral Sclerosis". PLoS ONE. 9 (5): e96528. doi:10.1371/journal.pone.0096528. PMC 4013026 . PMID 24806473. ↑ "Stephen Hawking serves as role model for ALS patients". CNN. 2009-04-20. ↑ Cookson, Mark R.; Wingo, Thomas S.; Cutler, David J.; Yarab, Nicole; Kelly, Crystal M.; Glass, Jonathan D. (2011). "The Heritability of Amyotrophic Lateral Sclerosis in a Clinically Ascertained United States Research Registry". PLoS ONE. 6 (11): e27985. doi:10.1371/journal.pone.0027985. ISSN 1932-6203. ↑ Sontheimer, Harald (2015). Diseases of the Nervous System. Academic Press. p. 170. ISBN 978-0-12-800403-6. Retrieved 2015-05-02. ↑ Conwit RA (December 2006). "Preventing familial ALS: A clinical trial may be feasible but is an efficacy trial warranted?". Journal of the Neurological Sciences. 251 (1–2): 1–2. doi:10.1016/j.jns.2006.07.009. ISSN 0022-510X. PMID 17070848. 1 2 Al-Chalabi A, Leigh PN (August 2000). "Recent advances in amyotrophic lateral sclerosis". Current Opinion in Neurology. 13 (4): 397–405. doi:10.1097/00019052-200008000-00006. ISSN 1473-6551. PMID 10970056. ↑ Battistini S, Ricci C, Lotti EM, Benigni M, Gagliardi S, Zucco R, Bondavalli M, Marcello N, Ceroni M, Cereda C (June 2010). "Severe familial ALS with a novel exon 4 mutation (L106F) in the SOD1 gene". Journal of the Neurological Sciences. 293 (1): 112–115. doi:10.1016/j.jns.2010.03.009. PMID 20385392. ↑ Andersen PM, Forsgren L, Binzer M, Nilsson P, Ala-Hurula V, Keränen ML, Bergmark L, Saarinen A, Haltia T, Tarvainen I, Kinnunen E, Udd B, Marklund SL (1996). "Autosomal recessive adult-onset amyotrophic lateral sclerosis associated with homozygosity for Asp90Ala CuZn-superoxide dismutase mutation, A clinical and genealogical study of 36 patients". Brain. 119 (4): 1153–1172. doi:10.1093/brain/119.4.1153. PMID 8813280. ↑ DeJesus-Hernandez, Mariely; Mackenzie, Ian R.; Boeve, Bradley F.; Boxer, Adam L.; Baker, Matt; Rutherford, Nicola J.; Nicholson, Alexandra M.; Finch, NiCole A.; Flynn, Heather; Adamson, Jennifer; Kouri, Naomi; Wojtas, Aleksandra; Sengdy, Pheth; Hsiung, Ging-Yuek R.; Karydas, Anna; Seeley, William W.; Josephs, Keith A.; Coppola, Giovanni; Geschwind, Daniel H.; Wszolek, Zbigniew K.; Feldman, Howard; Knopman, David S.; Petersen, Ronald C.; Miller, Bruce L.; Dickson, Dennis W.; Boylan, Kevin B.; Graff-Radford, Neill R.; Rademakers, Rosa (2011). "Expanded GGGGCC Hexanucleotide Repeat in Noncoding Region of C9ORF72 Causes Chromosome 9p-Linked FTD and ALS". Neuron. 72 (2): 245–56. doi:10.1016/j.neuron.2011.09.011. PMC 3202986 . PMID 21944778. ↑ Majounie, Elisa; Renton, Alan E; Mok, Kin; Dopper, Elise GP; Waite, Adrian; Rollinson, Sara; Chiò, Adriano; Restagno, Gabriella; Nicolaou, Nayia; Simon-Sanchez, Javier; van Swieten, John C; Abramzon, Yevgeniya; Johnson, Janel O; Sendtner, Michael; Pamphlett, Roger; Orrell, Richard W; Mead, Simon; Sidle, Katie C; Houlden, Henry; Rohrer, Jonathan D; Morrison, Karen E; Pall, Hardev; Talbot, Kevin; Ansorge, Olaf; Hernandez, Dena G; Arepalli, Sampath; Sabatelli, Mario; Mora, Gabriele; Corbo, Massimo; Giannini, Fabio; Calvo, Andrea; Englund, Elisabet; Borghero, Giuseppe; Floris, Gian Luca; Remes, Anne M; Laaksovirta, Hannu; McCluskey, Leo; Trojanowski, John Q; Van Deerlin, Vivianna M; Schellenberg, Gerard D; Nalls, Michael A; Drory, Vivian E; Lu, Chin-Song; Yeh, Tu-Hsueh; Ishiura, Hiroyuki; Takahashi, Yuji; Tsuji, Shoji; Le Ber, Isabelle; Brice, Alexis; Drepper, Carsten; Williams, Nigel; Kirby, Janine; Shaw, Pamela; Hardy, John; Tienari, Pentti J; Heutink, Peter; Morris, Huw R; Pickering-Brown, Stuart; Traynor, Bryan J (2012). "Frequency of the C9orf72 hexanucleotide repeat expansion in patients with amyotrophic lateral sclerosis and frontotemporal dementia: a cross-sectional study". The Lancet Neurology. 11 (4): 323–30. doi:10.1016/S1474-4422(12)70043-1. PMC 3322422 . PMID 22406228. 1 2 3 Deng, Han-Xiang; Chen, Wenjie; Hong, Seong-Tshool; Boycott, Kym M.; Gorrie, George H.; Siddique, Nailah; Yang, Yi; Fecto, Faisal; Shi, Yong; Zhai, Hong; Jiang, Hujun; Hirano, Makito; Rampersaud, Evadnie; Jansen, Gerard H.; Donkervoort, Sandra; Bigio, Eileen H.; Brooks, Benjamin R.; Ajroud, Kaouther; Sufit, Robert L.; Haines, Jonathan L.; Mugnaini, Enrico; Pericak-Vance, Margaret A.; Siddique, Teepu (2011). "Mutations in UBQLN2 cause dominant X-linked juvenile and adult-onset ALS and ALS/dementia". Nature. 477 (7363): 211–5. doi:10.1038/nature10353. PMC 3169705 . PMID 21857683. ↑ Johnson JO, Mandrioli J, Benatar M, Abramzon Y, Van Deerlin VM, Trojanowski JQ, Gibbs JR, Brunetti M, Gronka S, Wuu J, Ding J, McCluskey L, Martinez-Lage M, Falcone D, Hernandez DG, Arepalli S, Chong S, Schymick JC, Rothstein J, Landi F, Wang YD, Calvo A, Mora G, Sabatelli M, Monsurrò MR, Battistini S, Salvi F, Spataro R, Sola P, Borghero G, Galassi G, Scholz SW, Taylor JP, Restagno G, Chiò A, Traynor BJ (2010). "Exome Sequencing Reveals VCP Mutations as a Cause of Familial ALS". Neuron. 68 (5): 857–864. doi:10.1016/j.neuron.2010.11.036. PMC 3032425 . PMID 21145000. ↑ Buchan JR, Kolaitis RM, Taylor JP, Parker R (20 June 2013). "Eukaryotic stress granules are cleared by autophagy and Cdc48/VCP function". Cell. 153 (7): 1461–74. doi:10.1016/j.cell.2013.05.037. PMC 3760148 . PMID 23791177. ↑ Al-Saif A, Al-Mohanna F, Bohlega S (2011). "A mutation in sigma-1 receptor causes juvenile amyotrophic lateral sclerosis". Annals of Neurology. 70 (6): 913–919. doi:10.1002/ana.22534. PMID 21842496. ↑ Wu CH, Fallini C, Ticozzi N, Keagle PJ, Sapp PC, Piotrowska K, Lowe P, Koppers M, McKenna-Yasek D, Baron DM, Kost JE, Gonzalez-Perez P, Fox AD, Adams J, Taroni F, Tiloca C, Leclerc AL, Chafe SC, Mangroo D, Moore MJ, Zitzewitz JA, Xu ZS, van den Berg LH, Glass JD, Siciliano G, Cirulli ET, Goldstein DB, Salachas F, Meininger V, Rossoll W, Ratti A, Gellera C, Bosco DA, Bassell GJ, Silani V, Drory VE, Brown RH, Landers JE (2012). "Mutations in the profilin 1 gene cause familial amyotrophic lateral sclerosis". Nature. 488 (7412): 499–503. doi:10.1038/nature11280. PMC 3575525 . PMID 22801503. ↑ Takahashi Y, Fukuda Y, Yoshimura J, Toyoda A, Kurppa K, Moritoyo H, Belzil VV, Dion PA, Higasa K, Doi K, Ishiura H, Mitsui J, Date H, Ahsan B, Matsukawa T, Ichikawa Y, Moritoyo T, Ikoma M, Hashimoto T, Kimura F, Murayama S, Onodera O, Nishizawa M, Yoshida M, Atsuta N, Sobue G, Fifita JA, Williams KL, Blair IP, Nicholson GA, Gonzalez-Perez P, Brown RH, Nomoto M, Elenius K, Rouleau GA, Fujiyama A, Morishita S, Goto J, Tsuji S (2013). "ERBB4 mutations that disrupt the neuregulin-ErbB4 pathway cause amyotrophic lateral sclerosis type 19". Am. J. Hum. Genet. 93 (5): 900–5. doi:10.1016/j.ajhg.2013.09.008. PMC 3824132 . PMID 24119685. ↑ Kim HJ, Kim NC, Wang YD, Scarborough EA, Moore J, Diaz Z, MacLea KS, Freibaum B, Li S, Molliex A, Kanagaraj AP, Carter R, Boylan KB, Wojtas AM, Rademakers R, Pinkus JL, Greenberg SA, Trojanowski JQ, Traynor BJ, Smith BN, Topp S, Gkazi AS, Miller J, Shaw CE, Kottlors M, Kirschner J, Pestronk A, Li YR, Ford AF, Gitler AD, Benatar M, King OD, Kimonis VE, Ross ED, Weihl CC, Shorter J, Taylor JP (28 March 2013). "Mutations in the prion-like domains of hnRNPA2B1 and hnRNPA1 cause multisystem proteinopathy and ALS". Nature. 495 (7442): 467–73. doi:10.1038/nature11922. PMC 3756911 . PMID 23455423. ↑ Bruijn LI, Houseweart MK, Kato S, Anderson KL, Anderson SD, Ohama E, Reaume AG, Scott RW, Cleveland DW (1998). "Aggregation and motor neuron toxicity of an ALS-linked SOD1 mutant independent from wild-type SOD1". Science. 281 (5384): 1851–4. doi:10.1126/science.281.5384.1851. PMID 9743498. ↑ Reaume AG, Elliott JL, Hoffman EK, Kowall NW, Ferrante RJ, Siwek DF, Wilcox HM, Flood DG, Beal MF, Brown RH, Scott RW, Snider WD (1996). "Motor neurons in Cu/Zn superoxide dismutase-deficient mice develop normally but exhibit enhanced cell death after axonal injury". Nat Genet. 13 (1): 43–7. doi:10.1038/ng0596-43. PMID 8673102. ↑ Boillée S, Vande Velde C, Cleveland DW (2006). "ALS: a disease of motor neurons and their nonneuronal neighbors". Neuron. 52 (1): 39–59. doi:10.1016/j.neuron.2006.09.018. PMID 17015226. 1 2 Gardner, RC; Yaffe, K (May 2015). "Epidemiology of mild traumatic brain injury and neurodegenerative disease.". Molecular and cellular neurosciences. 66 (Pt B): 75–80. doi:10.1016/j.mcn.2015.03.001. PMC 4461453 . PMID 25748121. 1 2 Chen, H; Richard, M; Sandler, DP; Umbach, DM; Kamel, F (1 October 2007). "Head injury and amyotrophic lateral sclerosis.". American Journal of Epidemiology. 166 (7): 810–6. doi:10.1093/aje/kwm153. PMC 2239342 . PMID 17641152. ↑ "Concussion in professional football: helmet testing to assess impact performance--part 11." (PDF). United States Public Health Service Centers for Disease Control and Prevention National Institute for Occupational Safety and Health. 2004-01-10. Retrieved 2013-09-03. ↑ Lehman, EJ (2013). "Epidemiology of neurodegeneration in American-style professional football players.". Alzheimer's research & therapy. 5 (4): 34. doi:10.1186/alzrt188. PMC 3978683 . PMID 23876143. ↑ Beard, John D.; Kamel, Freya (1 January 2015). "Military service, deployments, and exposures in relation to amyotrophic lateral sclerosis etiology and survival". Epidemiologic Reviews. 37: 55–70. doi:10.1093/epirev/mxu001. ISSN 1478-6729. PMC 4325667 . PMID 25365170. ↑ Gardner, Raquel C.; Yaffe, Kristine (2015-05-01). "Epidemiology of mild traumatic brain injury and neurodegenerative disease". Molecular and Cellular Neurosciences. 66 (Pt B): 75–80. doi:10.1016/j.mcn.2015.03.001. ISSN 1095-9327. PMC 4461453 . PMID 25748121. ↑ "Kevin Turner, N.F.L. Player Who Later Fought the League, Dies at 46". New York Times. March 24, 2016. Retrieved 2016-03-27. ↑ Manuel M, Heckman CJ (March 2011). "Stronger is not always better: could a bodybuilding dietary supplement lead to ALS?". Exp Neurol (Review). 228 (1): 5–8. doi:10.1016/j.expneurol.2010.12.007. PMC 3049458 . PMID 21167830. ↑ Fernández-Borges N, Eraña H, Elezgarai SR, Harrathi C, Gayosso M, Castilla J (25 September 2013). "Infectivity versus seeding in neurodegenerative diseases sharing a prion-like mechanism". Int J Cell Biol. 2013: 583498. doi:10.1155/2013/583498. PMC 3800648 . PMID 24187553. ↑ Holtcamp, W. (2012). "The emerging science of BMAA: do cyanobacteria contribute to neurodegenerative disease?". Environmental Health Perspectives. 120 (3): a110–a116. doi:10.1289/ehp.120-a110. PMC 3295368 . PMID 22382274. ↑ Rodgers KJ (March 2014). "Non-protein amino acids and neurodegeneration: The enemy within". Experimental Neurology. 253: 192–196. doi:10.1016/j.expneurol.2013.12.010. PMID 24374297. 1 2 Rosenbohm A.; Kassubek J.; Weydt P.; Marroquin N.; Volk A.; Kubisch C.; Huppertz H.; Weber M. (2014). 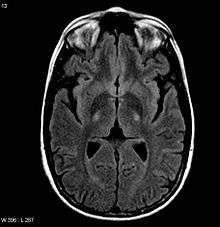 "Can lesions to the motor cortex induce amyotrophic lateral sclerosis?". J Neurol. 261: 283–290. doi:10.1007/s00415-013-7185-7. 1 2 Walling, Anne D. (1999). "Amyotrophic lateral sclerosis: Lou Gehrig's disease". American Family Physician. 59 (6): 1489–96. PMID 10193591. ↑ Sutedja NA, Fischer K, Veldink JH, van der Heijden GJ, Kromhout H, Heederik D, Huisman MH, Wokke JJ, van den Berg LH (2009). "What we truly know about occupation as a risk factor for ALS: a critical and systematic review". Amyotrophic Lateral Sclerosis. 10 (5–6): 295–301. doi:10.3109/17482960802430799. PMID 19922116. ↑ Fang, Fang; Ingre, Caroline; Roos, Per; Kamel, Freya; Piehl, Fredrik (2015). "Risk factors for amyotrophic lateral sclerosis". Clinical Epidemiology. 7: 181–93. doi:10.2147/CLEP.S37505. PMC 4334292 . PMID 25709501. ↑ Kamel, F; Umbach, DM; Bedlack, RS; Richards, M; Watson, M; Alavanja, MC; Blair, A; Hoppin, JA; Schmidt, S; Sandler, DP (June 2012). "Pesticide exposure and amyotrophic lateral sclerosis". Neurotoxicology. 33 (3): 457–62. doi:10.1016/j.neuro.2012.04.001. PMC 3358481 . PMID 22521219. ↑ Bozzoni, V; Pansarasa, O; Diamanti, L; Nosari, G; Cereda, C; Ceroni, M (2016). "Amyotrophic lateral sclerosis and environmental factors.". Functional neurology. 31 (1): 7–19. PMC 4819821 . PMID 27027889. ↑ Malek, AM; Barchowsky, A; Bowser, R; Youk, A; Talbott, EO (August 2012). "Pesticide exposure as a risk factor for amyotrophic lateral sclerosis: a meta-analysis of epidemiological studies: pesticide exposure as a risk factor for ALS.". Environmental research. 117: 112–9. doi:10.1016/j.envres.2012.06.007. PMID 22819005. ↑ Deng, Han-Xiang; Zhai, Hong; Bigio, Eileen H.; Yan, Jianhua; Fecto, Faisal; Ajroud, Kaouther; Mishra, Manjari; Ajroud-Driss, Senda; Heller, Scott; Sufit, Robert; Siddique, Nailah; Mugnaini, Enrico; Siddique, Teepu (2010). "FUS-immunoreactive inclusions are a common feature in sporadic and non-SOD1 familial amyotrophic lateral sclerosis". Annals of Neurology. 67 (6): 739–48. doi:10.1002/ana.22051. PMC 4376270 . PMID 20517935. ↑ Hänsel Y, Ackerl M, Stanek G (1995). "ALS-like sequelae in chronic neuroborreliosis". Wien Med Wochenschr. 145 (7–8): 186–8. PMID 7610670. ↑ el Alaoui-Faris M, Medejel A, al Zemmouri K, Yahyaoui M, Chkili T (1990). "Amyotrophic lateral sclerosis syndrome of syphilitic origin. 5 cases". Rev Neurol (Paris). 146 (1): 41–4. PMID 2408129. ↑ Umanekiĭ KG, Dekonenko EP (1983). "Structure of progressive forms of tick-borne encephalitis". Zh Nevropatol Psikhiatr Im S S Korsakova. 83 (8): 1173–9. PMID 6414202. ↑ Silani V, Messina S, Poletti B, Morelli C, Doretti A, Ticozzi N, Maderna L (2011). "The diagnosis of Amyotrophic lateral sclerosis in 2010". Archives italiennes de biologie. 149 (1): 5–27. doi:10.4449/aib.v149i1.1260. PMID 21412713. ↑ Eisen, A. (2002). "Amyotrophic lateral sclerosis: A review". BCMJ. 44 (7): 362–366. ↑ Davenport RJ, Swingler RJ, Chancellor AM, Warlow CP (1996). "Avoiding false positive diagnoses of motor neuron disease: lessons from the Scottish Motor Neuron Disease Register". J. Neurol. Neurosurg. Psychiatr. 60 (2): 147–51. doi:10.1136/jnnp.60.2.147. PMC 1073793 . PMID 8708642. ↑ Chieia, Marco A.; Oliveira, Acary S.B. ; Silva, Helga C.A. ; Gabbai, Alberto Alain (2010). "Amyotrophic lateral sclerosis: considerations on diagnostic criteria". Arquivos de Neuro-Psiquiatria. 68 (6): 837–42. doi:10.1590/S0004-282X2010000600002. PMID 21243238. ↑ Al-Asmi A, Nandhagopal R, Jacob PC, Gujjar A (2012). "Misdiagnosis of Myasthenia Gravis and Subsequent Clinical Implication: A case report and review of literature". Sultan Qaboos University medical journal. 12 (1): 103–108. doi:10.12816/0003095. PMC 3286704 . PMID 22375266. ↑ "Lambert-Eaton Myasthenic Syndrome (LEMS)". Misc.medscape.com. Retrieved 18 April 2013. ↑ "LEMS.com, Lambert-Eaton Myasthenic Syndrome: About". Lems.com. Retrieved 18 April 2013. ↑ Carlesi C, Pasquali L, Piazza S, Lo Gerfo A, Caldarazzo Ienco E, Alessi R, Fornai F, Siciliano G (March 2011). "Strategies for clinical approach to neurodegeneration in Amyotrophic lateral sclerosis". Archives italiennes de biologie. 149 (1): 151–67. doi:10.4449/aib.v149i1.1267. PMID 21412722. ↑ Miller, RG; Mitchell, JD; Moore, DH (14 March 2012). "Riluzole for amyotrophic lateral sclerosis (ALS)/motor neuron disease (MND)." (PDF). The Cochrane Database of Systematic Reviews. 3: CD001447. doi:10.1002/14651858.CD001447.pub3. PMID 22419278. ↑ Miller RG, Mitchell JD, Lyon M, Moore DH (2007). Miller RG, ed. "Riluzole for amyotrophic lateral sclerosis (ALS)/motor neuron disease (MND)". Cochrane Database of Systematic Reviews (1): CD001447. doi:10.1002/14651858.CD001447.pub2. PMID 17253460. ↑ Russell P, Harrison R (2014). "What is amyotrophic lateral sclerosis". Clinical Pharmacist. 6 (7). ↑ Sviri S, Linton DM, van Heerden PV (Jun 2005). "Non-invasive Mechanical Ventilation Enhances Patient Autonomy in Decision-Making Regarding Chronic Ventilation". Critical Care and Resuscitation. 7 (2): 116–118. PMID 16548804. ↑ Lewis M, Rushanan S (2007). "The role of physical therapy and occupational therapy in the treatment of Amyotrophic Lateral Sclerosis". NeuroRehabilitation. 22 (6): 451–461. PMID 18198431. 1 2 Kasarskis EJ, Berryman S, Vanderleest JG, Schneider AR, McClain CJ (Jan 1996). "Nutritional status of patients with amyotrophic lateral sclerosis: relation to the proximity of death". Am J Clin Nutr. 63 (1): 130–7. PMID 8604660. ↑ Holm T, Maier A, Wicks P, Lang D, Linke P, Münch C, Steinfurth L, Meyer R, Meyer T (Apr 2013). "Severe Loss of Appetite in Amyotrophic Lateral Sclerosis Patients: Online Self-Assessment Study". Interact J Med Res. 2 (1): e8. doi:10.2196/ijmr.2463. PMC 3632382 . PMID 23608722. ↑ Hamadeh MJ, Rodriguez MC, Kaczor JJ, Tarnopolsky MA (Feb 2005). "Caloric restriction transiently improves motor performance but hastens clinical onset of disease in the Cu/Zn-superoxide dismutase mutant G93A mouse". Muscle Nerve. 31 (2): 214–20. doi:10.1002/mus.20255. PMID 15625688. ↑ Slowie LA, Paige MS, Antel JP (Jul 1983). "Nutritional considerations in the management of patients with amyotrophic lateral sclerosis (ALS)". J Am Diet Assoc. 83 (1): 44–7. PMID 6863783. ↑ Payne, C; Wiffen, PJ; Martin, S (18 January 2012). "Interventions for fatigue and weight loss in adults with advanced progressive illness.". The Cochrane database of systematic reviews. 1: CD008427. doi:10.1002/14651858.cd008427.pub2. PMID 22258985. ↑ ALS Association. Quick Facts About ALS & The ALS Association. ↑ "ALS Topic Overview". Archived from the original on 1 May 2008. Retrieved 2008-05-01. 1 2 Walling AD (1999). "Amyotrophic lateral sclerosis: Lou Gehrig's disease". American Family Physician. 59 (6): 1489–1496. PMID 10193591. ↑ Gordon Paul (2011). "Amyotrophic Lateral Sclerosis. Pathophysiology, Diagnosis and Management". CNS Drugs. 25 (1): 1–15. doi:10.2165/11586000-000000000-00000. ↑ "Sla, indagini nei club. Pesticidi nel mirino". Archived from the original on 3 October 2008. Retrieved 2008-10-02. ↑ Wicks P, Abrahams S, Masi D, Hejda-Forde S, Leigh PN, Goldstein LH (2005). "The Prevalence of Depression and Anxiety in MND". Amyotrophic Lateral Sclerosis and Other Motor Neuron Disorders. 6 (Supplement 1): 147. ISSN 1466-0822. ↑ Rachele MG, Mascia V, Tacconi P, Dessi N, Marrosu F, Giagheddu M (April 1998). "Conjugal amyotrophic lateral sclerosis: a report on a couple from Sardinia, Italy". Ital J Neurol Sci. 19 (2): 97–100. doi:10.1007/BF02427565. PMID 10935845. ↑ Poloni M, Micheli A, Facchetti D, Mai R, Ceriani F, Cattalini C (April 1997). "Conjugal amyotrophic lateral sclerosis: toxic clustering or change?". Ital J Neurol Sci. 18 (2): 109–12. doi:10.1007/BF01999572. PMID 9239532. ↑ Camu W, Cadilhac J, Billiard M (March 1994). "Conjugal amyotrophic lateral sclerosis: a report on two couples from southern France". Neurology. 44 (3 Pt 1): 547–8. doi:10.1212/WNL.44.3_Part_1.547. PMID 8145930. ↑ Cornblath DR, Kurland LT, Boylan KB, Morrison L, Radhakrishnan K, Montgomery M (November 1993). "Conjugal amyotrophic lateral sclerosis: report of a young married couple". Neurology. 43 (11): 2378–80. doi:10.1212/WNL.43.11.2378. PMID 8232960. ↑ Corcia P, Jafari-Schluep HF, Lardillier D, Mazyad H, Giraud P, Clavelou P, Pouget J, Camu W (November 2003). "A clustering of conjugal amyotrophic lateral sclerosis in southeastern France". Neurol. 60 (4): 553–7. doi:10.1001/archneur.60.4.553. PMID 12707069. ↑ "Farewell Speech". lougehrig.com. 4 July 1939. Archived from the original on 12 April 2008. Retrieved 16 April 2008. ↑ McAuliffe, Kathleen (July 22, 2011). "Are Toxins in Seafood Causing ALS, Alzheimer's, and Parkinson's?". Discover Magazine. ↑ "George Bush delivers possibly the best ALS ice bucket challenge yet". Independent. Retrieved 20 August 2014. ↑ "Ice Bucket Challenge funds gene discovery in ALS (MND) research". BBC News. 2016-07-27. Retrieved 2016-07-27. ↑ Alexander, Ella. "Ice Bucket Challenge: Lady Gaga, Justin Bieber, G-Dragon and Oprah – the most entertaining reactions so far". ↑ "Ice Bucket Challenge funds discovery of gene linked to ALS". Retrieved 2016-07-27. ↑ Kenna, Kevin P; Doormaal, Perry T C van; Dekker, Annelot M; Ticozzi, Nicola; Kenna, Brendan J; Diekstra, Frank P; Rheenen, Wouter van; Eijk, Kristel R van; Jones, Ashley R. "NEK1 variants confer susceptibility to amyotrophic lateral sclerosis". Nature Genetics. 48 (9): 1037–1042. doi:10.1038/ng.3626. ↑ Press release project MinE, june 21st 2013 : "Archived copy" (PDF). Archived from the original (PDF) on 3 December 2013. Retrieved 2014-05-09. ↑ "National Amyotrophic Lateral Sclerosis (ALS) Registry". Dec 15, 2014. Retrieved 25 August 2015. 1 2 "ALSUntangled: Introducing The Table of Evidence". 2014-12-27. Retrieved 2016-10-30. ↑ Pastula, DM; Moore, DH; Bedlack, RS (12 December 2012). "Creatine for amyotrophic lateral sclerosis/motor neuron disease.". The Cochrane database of systematic reviews. 12: CD005225. PMID 23235621. ↑ Fang, J; Zhou, M; Yang, M; Zhu, C; He, L (31 May 2013). "Repetitive transcranial magnetic stimulation for the treatment of amyotrophic lateral sclerosis or motor neuron disease.". The Cochrane database of systematic reviews (5): CD008554. PMID 23728676. ↑ "Simplified Study Aims To Quickly Test A Long-Shot ALS Treatment". 2016-10-25. Retrieved 2016-10-30. ↑ "Public summary of opinion on orphan designation Masitinib mesilate for treatment of amyotrophic lateral sclerosis" (PDF). EMA. Retrieved 6 November 2016. This article incorporates public domain material from the United States Department of Health and Human Services website http://www.ninds.nih.gov/disorders/amyotrophiclateralsclerosis/detail_als.htm. Wikimedia Commons has media related to Amyotrophic lateral sclerosis.